Biography of Early Renaissance Oil Painter from Sicily. Antonello da Messina, a Sicilian painter who became an important figure in Renaissance art, is believed to have absorbed a method of oil painting pioneered by Jan van Eyck, achieving in the process a careful synthesis between the Italian and Northern Renaissance styles. He was certainly one of the first artists to introduce oils and Northern Flemish painting techniques to the mid-15th century Renaissance in Venice. According to art biographer Giorgio Vasari (1511-74), Antonello brought the 'secret' of oil painting to Venice. Indeed, Messina influenced a generation of Italian artists - notably Giovanni Bellini (1430-1507) - with his work. His most famous paintings include: Christ Crowned with Thorns (1470, Metropolitan Museum of Art, New York); St Jerome in his Study (c.1460, National Gallery, London); Portrait of a Man (1475, National Gallery, London); and San Cassiano Altar (1475-76, Kunsthistorisches Museum, Vienna). He is one of the greatest Old Masters from Sicily and a key contributor to Early Renaissance painting in Italy. Little is known of Messina's early life. Records show that he was artistically trained in Naples, then an important centre of Early Renaissance art. He was taught by the painter Niccolo Colantonio. Colantonio practiced a synthesis of artistic styles, combining influences from Burgundy, Flanders and Provence. There is some documentary evidence to suggest that he may have learnt oil painting techniques from a relative of Jan Van Eyck, who was in Naples around 1440. Messina's first recorded important work is the Sibiu Crucifixion (c.1455, Museum of Art, Bucharest) and St Jerome in His Study (c.1460, National Gallery, London). Both already show the artist's characteristic combination of Flemish technique and realism, combined with a typically Italian modelling of figurative forms. Contrary to usual practice, he created form with blocks of colour instead of line. Messina was not only influenced by his Master Colantonio, but also by the works he had seen of the Northern Renaissance painters Jan van Eyck and Roger van der Weyden. It has also been suggested that Messina may have met Van Eyck's successor Petrus Christus (c.1410-1475) in Milan in 1456. Christus had taken over the Van Eyck's workshop in Bruges after his death. A document testifying to the presence of a 'Piero da Bruggia' (Petrus from Bruges?) in Milan in 1456, suggests that he may have been in the city at the same time as Messina. This would certainly account for the similarities between Christus' Portrait of a Man (LA County Museum of Art) and many of Messina's portraits, including his Portrait of a Man (National Gallery, London). There are also strong influences of Piero della Francesca in Messina's treatment of his figures, particularly in the use of volumetric proportions. In 1470 Messina travelled to Venice to study works by Giovanni Bellini, already a major figure in Venetian painting of the period. It was also around this time that he signed his first painting: Salvator Mundi (c.1465, National Gallery, London). Messina's particular genius was for portrait art - notably the single portrait depicting his subjects in three quarter view. His sitters display highly realistic expressions, and consequently make a connection with the viewer that few artists before managed to achieve. Portrait of a Man (c. 1460's, Museo della Fondazione Culturale Mandralisca, Cefalu, Sicily) is an excellent example. The subject has a mischievous look, and his knowing smile and side glance conveys a conspiratorial bond with the viewer. Messina's Portrait of a Man (c.1475, National Gallery, London) is a relatively late work. It is often thought to be a self-portrait, because of the direct gaze, as if painted while looking in a mirror. However, x-rays reveal that the painter originally painted the eyes turned to the side, which puts this theory into dispute. The attention to detail in this painting is comparable with Netherlandish portraits, and it demonstrates the artist's mastery of oil paints. The use of oils enabled him to make small scale works with miniaturist detail and subtle variations of tone and colour. Although Messina is chiefly famous for his Renaissance portraits, he was equally gifted at painting religious subjects, panels and cabinet pictures. A fine example of this is St Jerome in his Study (c.1460, National Galllery, London). This painting was first recorded in a Venetian collection in 1529, and attributed to Messina, Hans Memling or Jan Van Eyck. Saint Jerome was one of the four Fathers of the Church and was often represented in Renaissance art. It is thought that Messina painted this picture while in Venice in the 1470s. Van Eyck is thought to have painted another version of St Jerome, while in Naples in 1456, and Messina may have seen this, and have been inspired. The Virgin and Child (c.1460-9, National Gallery London), is another wonderful piece of religious art by Messina. It depicts Mary, holding the baby Jesus, as two angels hold a crown over her head. It probably served for private devotion. Although not signed, it's attribution to the artist is supported by comparing the geometric treatment of the features of the Virgin with the same figure in the documented Saint Gregorio Altarpiece (1473, Museo Regionale, Messina). Additionally, the angels and crown demonstrate influences of Netherlandish art, and examples existed in Naples at the time Messina worked there. 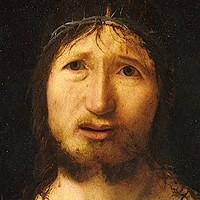 Messina painted a series of versions of Christ Crowned with Thorns, also known as Ecce Homo. His 1470 version, painted with tempera and oils (Metropolitan Museum of Art, New York) is perhaps his most powerful. It differs from more traditional versions painted during the Italian Renaissance, which tended to be 'prettier'. Messina's Ecce Homo shows Jesus face, with the countenance of a strong, thick nosed Sicilian peasant. He stares directly at the viewer, mouth half open in shock, in silent anguish. He seems to be expressing the sorrows of the world towards the viewer. The other 3 paintings on this theme are at the Museo Civico, Piacenza (dated 1472); the Kunsthistorisches Museum, Vienna (dated 1474) and the National Gallery of the Palazzo Spinola, Genoa (not dated). Messina completed his final masterpiece, Virgin Annunciate (National Museum, Palermo) in about 1476. He died in 1479, and his remaining unfinished works were completed by his son Jacobello da Messina. Although Messina was not as well known or documented as some of his Northern Italian contemporaries, like Fra Angelico and Piero della Francesca, he is regarded as one of the greatest early Renaissance artists to emerge from Southern Italy in the 15th century. What is amazing, is how, coming from a provincial backwater town, he managed to achieve such a masterly and worldly style. - Salvator Mundi (c.1465, National Gallery, London).